In this article, you'll learn about different storage classes in C++. Namely: local, global, static local, register and thread local. Every variable in C++ has two features: type and storage class. Type specifies the type of data that can be stored in a variable. For example: int, float, char etc. 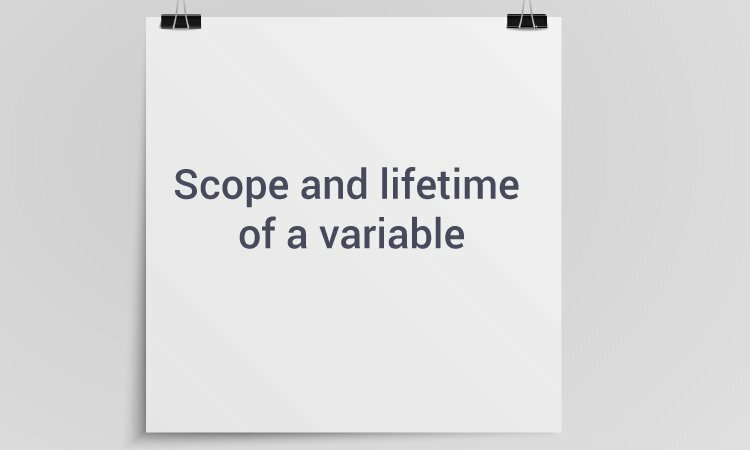 And, storage class controls two different properties of a variable: lifetime (determines how long a variable can exist) and scope (determines which part of the program can access it). A variable defined inside a function (defined inside function body between braces) is called a local variable or automatic variable. Its scope is only limited to the function where it is defined. In simple terms, local variable exists and can be accessed only inside a function. The life of a local variable ends (It is destroyed) when the function exits. The variable var cannot be used inside test() and var1 cannot be used inside main() function. But, after C++11 auto has a different meaning and should not be used for defining local variables. If a variable is defined outside all functions, then it is called a global variable. The scope of a global variable is the whole program. This means, It can be used and changed at any part of the program after its declaration. Likewise, its life ends only when the program ends. In the above program, c is a global variable. This variable is visible to both functions main() and test() in the above program. A static local variable exists only inside a function where it is declared (similar to a local variable) but its lifetime starts when the function is called and ends only when the program ends. The main difference between local variable and static variable is that, the value of static variable persists the end of the program. In the above program, test() function is invoked 2 times. During the first call, variable var is declared as static variable and initialized to 0. Then 1 is added to var which is displayed in the screen. When the function test() returns, variable var still exists because it is a static variable. During second function call, no new variable var is created. The same var is increased by 1 and then displayed to the screen. Keyword register is used for specifying register variables. Register variables are similar to automatic variables and exists inside a particular function only. It is supposed to be faster than the local variables. If a program encounters a register variable, it stores the variable in processor's register rather than memory if available. This makes it faster than the local variables. However, this keyword was deprecated in C++11 and should not be used. Thread-local storage is a mechanism by which variables are allocated such that there is one instance of the variable per extant thread. Keyword thread_local is used for this purpose. Learn more about thread local storage.